This is one of our newer soaps. We added Birch, Fir and Eucalyptus essential oils to create a synergistic blend of Nordic ingredients, hence the name “New Nordic Blend”. We especially like this soap, as the blend just seems right. Extracted from the bark of Birch trees in northern Scandinavia, Birch imparts a wintergreen scent and is very beneficial to skin, especially with its anti-inflammatory qualities. Birch also possesses a lightening effect to the skin. Steam distilled from the needles of the Fir tree. Fir essential oil has a sharp crisp, clean scent of fir needles. Fir essential oil comes from the tree that grows widely across areas of northern Scandinavia. The Scandinavians used Fir Needles in the sauna, and it was used as an aromatic in bedding. Fir essential oil is especially effective in the relief of muscle pain. This oil is extracted through steam distillation of the leaves and branches of the Eucalyptus tree. Fragrant and fresh, this essential oil has naturally deodorant and expectorant properties. Eucalyptus essential oil is a scent that is at home in a sauna or spa. Ground needles of the fir tree are ground to impart more of the properties of fir and also to impart a slight exfoliation. 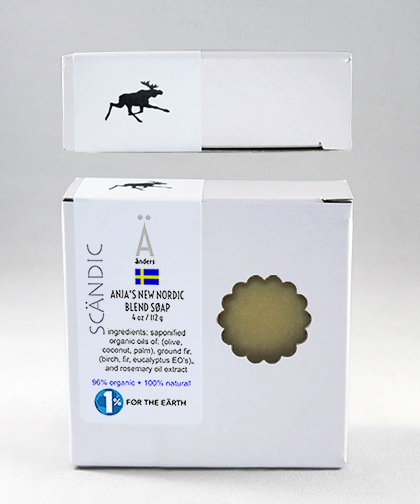 The ground Fir from Scandinavia adds such a pleasant scent to our soaps. It imparts a citrusy, invigorating evergreen scent.